Part of the group who met up with us in Chicago! In a slight departure from other episodes, I’m playing the role of an introvert anthropologist. The context? This week is Podcast Movement, a conference for podcasters that offers oodles of ideas, inspiration, and connection. 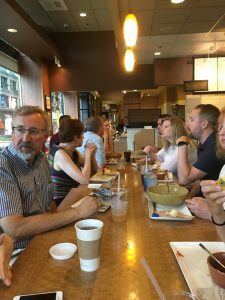 My friend, Dave Stachowiak of Coaching for Leaders, invited me to co-host an informal meetup here in Chicago during the conference. We met last night in the middle of a downpour on Michigan Avenue. Our refuge was Panera Bread, and that’s where I asked attendees if I could do impromptu interviews with them. To my delight, they all agreed! This episode is titled “Introverts in the Wild” because it’s spontaneous, unscripted, and informal. You’ll meet nine people, most introverts, who each share a slice of their story and what inspires them. You’ll also hear the sounds of the wild by way of other people in the space, so this is more reporter-on-the-street than sterile studio sound. I hope you enjoy listening as much as I enjoyed interviewing them!